The right shower can transport you from your humble home to a fabulous getaway or a relaxing spa. Upgrade your bathroom with a freshly remodeled shower to enhance your own enjoyment and to create the kind of bathing experience that many prospective buyers actively seek in a home that they consider buying. 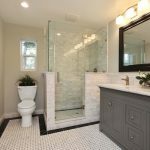 A full bathroom remodel can boost your home’s resale price by 20%, and a remodeled shower can often sway buyers into putting an offer in on your home. Read on to learn more about all the planning that goes into a shower remodel and how to decide whether to do the work yourself or hire a professional. We rounded up some ideas and inspiration to get you started, but your project should be in line with your personal style, your budget and your dream design. How Extensive is Your Remodel? Is it important to improve on the resale value of your house? Do you want to enlarge the shower or just replace the current materials for a new look? Are you comfortable doing some of the work yourself, or do you want to hire a professional? Do you want integrated shelves to hold bath products or a bench for seating? Do you envision a glass enclosure? What style do you like best? Look at the shower you have now and envision what you want to achieve. Some of the popular types of showers and remodels include the following options. Walk ins are popular options that offer easy access, which makes them particularly well suited for older people, users with mobility limitations, and even people with pets. Useful features with this style include sill-less showers with graded floors for drainage. 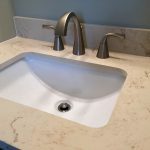 The cost of this remodel depends on a variety of factors, including where you live (pricey areas such as Silicon Valley in California cost more than small towns in an area with a lower cost of living), whether you need any plumbing upgrades and the cost of the materials you choose. Shower stalls offer space efficiency, but that doesn’t mean they have to be boring. Adding attractive finishes and extra features such as a folding seat can make the space feel luxurious. Replacing the stall itself costs as little as $400. Professional installation and added features drive the cost up. If you have a stall-only shower, you can remodel the area to add a tub and shower combination that’s equally well suited to long soaks and quick rinses. Switching out the tub in favor of a luxe shower is a huge trend in bathroom remodeling, although experts warn against getting rid of the only tub in the house. Even if you don’t plan to sell your home in the near future, keep in mind that prospective buyers prefer homes with at least one tub, especially buyers with young children. 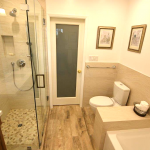 If you opt for a simple shower stall, this project can be very budget friendly. 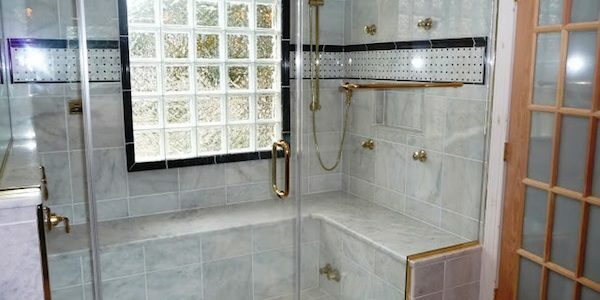 Tiled showers, glass enclosures and professional installation increase the price. Seamless glass enclosures are popular for small showers because they provide the illusion of extra space. Additionally, designing a small shower with a spout positioned perfectly to skip the enclosure completely can make the space feel larger. Adding a skylight can also help open things up without taking up space. Additional materials such as backer board, adhesive, thinset and grout, waterproofing membranes and edging increase the cost of this project. With installation, most homeowners pay around $25 or more per square foot. Some of the biggest trends center around custom elements such as integrated benches and seats, steam showers and built-in sound systems. When it comes to the fixtures, multiple shower heads and rain showers are unique options. 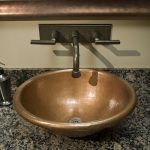 Fixtures start at prices around $400 with installation, while custom elements can extend into the $1,000 range. Once you have your vision in mind, meet with a remodeling pro to help get your ideas in line with your budget. If money isn’t an issue, you can go ahead and pick out your dream materials and draw up plans. If you’re on a tighter budget, a professional can help you modify your vision to get the look you want without busting your bottom line. Need to find a pro for your shower remodel? The national average for installing a shower is $3,165, while shower remodels typically cost anywhere from $250 to $4,000 or more. That figure can skyrocket quickly if you factor in extensive plumbing upgrades and luxury features. The costs of remodeling fall into three categories: basic, mid-range and high-end. If you’re on a budget, you can make several small changes to freshen up your shower without spending a mint. Some of the least expensive options can still make an impact on the look and feel. Acrylic shower kits fit over your existing tub and shower walls, and they provide an instantly fresh look at a low price of $150 to $250. On the downside, these kits usually come in limited colors and styles, and the material doesn’t last nearly as long as tile can. Alternatively, installing new fixtures and tile can create a great visual without spending too much. Stick with basic ceramic tiles, which start as low as $1.30 per square foot. Simple glass doors cost $100 to $300, and single shower heads start at around $40, making it easy to get a sleek, fresh look on a budget. If you want more than just updated tile and fixtures, consider replacing the tub or shower floor. Opt for upgraded glass doors and showerheads with added luxury. Approaching a shower remodel as a DIY project can be tricky. If the finished product looks like an amateur did the work, you’re not going to get the pleasure or return on the time and money that you invest in the project. Whether you do the work yourself or hire a professional, experts recommend budgeting more than you think you need to cover incidentals such as hidden water damage caused by a leaky shower pan or unforeseen plumbing issues — consider adding at least 15% to your overall budget to accommodate. If you choose to do the work yourself, you can save a significant chunk of change. You can also easily end up with a catastrophe on your hands. For basic remodels, you can usually handle most of the work, but for more intricate jobs, especially those that involve moving the shower, expanding the space or adding additional lighting, you should hire a plumber and/or an electrician. The implications of shoddy DIY plumbing conjure up costly, nightmarish visions of terrible leaks and ugly water damage. Being true to your preferred style. 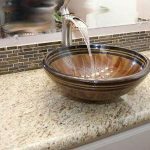 If you like a modern look, opting for vintage fixtures or traditional designs might leave your end result lacking. Choosing your color palette carefully. Your shower remodel should last for years to come. Don’t go with a color that you’re unsure of just to keep up with trends. All white, white and gray, warm wood tones and neutrals are all popular options that endure the test of time. Splurging on the features that matter most. If you really want dual showerheads or a steam generator, find a way to make it happen if you can. Be sure to use water-efficient fixtures, which appeal to prospective homebuyers and can save you money on future utility bills. How long have you been working in this field? Did you receive formal training? Could you provide me with references that I can contact? Do you have photos of past projects I can view? How long do you expect this remodel to take? Will you provide the materials, or should I? 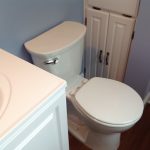 Do you clean up at the end of the remodel? How much extra do you charge for grout, mortar and backer board? What is your plan if we run into plumbing issues such as necessary replacement or rerouting? Browse through pictures of 10 of the top design trends to get some ideas for your own bathroom. Modern showers are all about luxury. From oversized spaces with seating to nicely appointed stalls with stylish accents, you can use this inspiration to design the shower of your dreams. Seamless showers have been popular for years, but they haven’t always been as common as they’re becoming. There’s also an increasing demand for showers without a sill. Not only does this look sleek, but it also offers easy access for anyone who might face mobility challenges when stepping up and over a sill. Many homeowners choose to get rid of their tubs altogether in favor of large showers with multiple showerheads and spa-like rain showers. 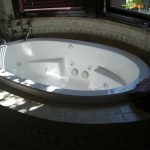 Home experts warn against getting rid of your tub if you’re remodeling the only bathroom in your house, though. 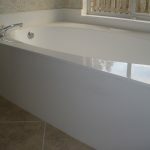 Don’t forget that buyers like to have the option of a tub in at least one bathroom. In years past, utility and function were of the utmost concern in bathroom design. The design world has seen a resurgence in using various decor elements to create a desired feeling in addition to infusing the room with functionality. From coastal-inspired bathrooms like the one above to spa-like retreats, you can let your shower remodel provide an escape from your everyday life. From full-blown themes to small accent walls, Mediterranean-inspired features give modern bathrooms a touch of Old World style. Choose from intricate tiles, colorful mosaics, arabesque patterns, Spanish tile or Mediterranean arches for a fresh focal point with global appeal. The nuts and bolts of using industrial-chic design in a shower can be challenging. Balance industrial touches like the pipe shower above with warm tones and a few natural elements to prevent your bathroom from looking overly cold. Doorless showers are a popular option, particularly in smaller bathrooms. Without an obstructing curtain or a large glass enclosure, these feel open and free. Steam showers are — literally — a hot trend. Increasing numbers of homeowners are opting to splurge for this extra luxury. From small steam shower stalls to oversized showers with integrated benches, this trend takes many different shapes. These aren’t the colorful bathrooms of the 70s. Modern homeowners use fresh hues to break up their neutrals and add a little visual interest to the bathroom. The above example with just a splash of blue and green is a great example of how to work color into a bathroom without letting it overwhelm the space. 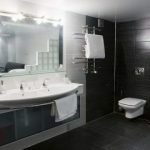 Image Credit: HA My Design, Inc.
All-white bathrooms are increasingly popular choices for their crisp, eye-pleasing look. Homeowners who want to achieve a similarly crisp look while still using a little color can mimic the effect by pairing white cabinets and white accents with very light neutrals. Modern showers are all about using unexpected materials. Natural materials, including rock and specially treated wood, add warmth and a surprisingly chic touch. 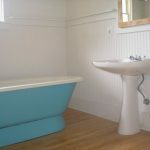 Bathtub Refinishing: A Brand New Tub at a Fraction of the Cost!